I have abstained from baking, particularly cakes for the last few weeks. Well one can only abstain for so long! It was a long weekend here last week and I wanted to make a cake! You would imagine that I would have known exactly what to bake but that was not the case, choosing which cake proved to be a hard decision. 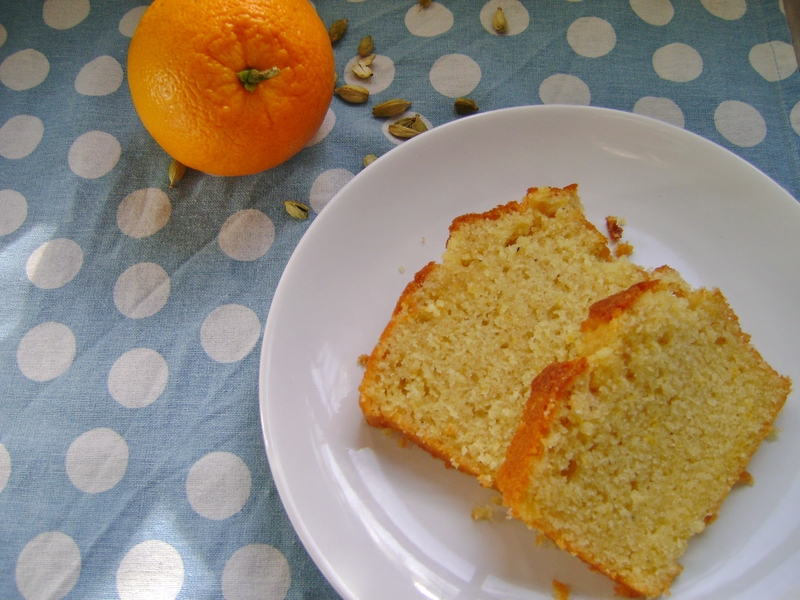 Lots of recipe perusing left me with a craving for an orange cake, lots more perusing led me to the discovery of orange and cardamom cakes! After all this perusing I was out of time and now didn’t have all the ingredients for any of the cakes I found so I improvised, using my Lemon Olive Oil cake recipe but swapping orange and cardamom for lemon and making my own buttermilk as I forgot to buy yoghurt! I could not have been more disorganised if Id tried! Despite my disorganisation this cake was a triumph! Orange and cardamom are a match made in heaven! The smell of the fresh ground cardamom and the orange zest is amazing, if ever I get around to making my own body scrub this will be the scent I use! The cake is light and fluffy and very moist. Pre heat your oven to 180 C, 350 F, Gas 4. Grease and base line a loaf tin. Remove the seeds from the cardamom pods and grind until powdery using a pestle and mortar. Add to the sugar with the orange zest and using your fingers mix together well, this releases the oils in the zest and makes a wonderful fragrant mix. Whisk together the orange, cardamom sugar and the eggs, adding the eggs one at a time. I use my stand mixer for this. Pour into prepared loaf tin and bake for 45 minutes. Allow to cool in the tin for 10 minutes before turning out to cool completely. This entry was posted on May 31, 2013, 15:32 and is filed under Baking, dessert. You can follow any responses to this entry through RSS 2.0. You can leave a response, or trackback from your own site. I love cardamom and this recipe sounds very tasty! Great pictures! nummy num. love how you came to create this recipe 🙂 Looks so pretty and tasty. Also liking your polka dot tablecloth–pretty. Ummmm Cardamom 🙂 I adore loaf cakes..yours looks delightful. I never have buttermilk around, I always have to make it with milk and cider vinegar before I bake! It’s such a good tip to have under your belt isn’t it? Seriously then…sounds wonderful;just love the flavor combination. Thank you! Oh I do wish you could pop over! these looks scrumptious! would be perfect with a cup of tea in the morning. i made an orange loaf recently that also called for an icing that i kinda botched, wahwah…i’m gonna try this!!! Thank you! I wonder what happened to your icing? Cakes without icing are much easier! Thank you! I’m a cardamom convert! Thank you! I love using olive oil in cakes, makes a great textured cake! Wow Jayne, this cake looks so good and the aroma in your kitchen must have been wonderful. Thank you! Indeed, the aroma was fabulous! Thanks also for the tip re buttermilk – I would never have known it was that simple! Thank you! Yes, another olive oil cake! Your hazelnut one sounds amazing, can’t wait to try it!